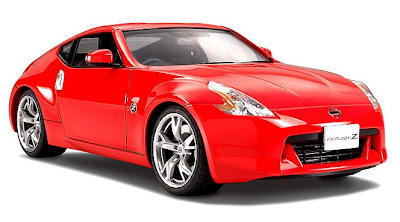 One of Tamiya’s upcoming releases is a 1:24 scale Nissan 370Z (red car top), the latest in a long line of Nissan ‘Z’ cars. 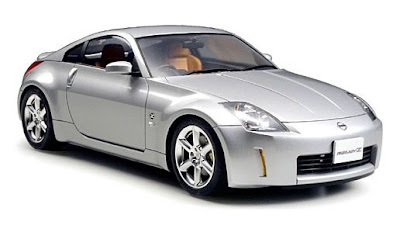 Tamiya also makes a nice model of its immediate predecessor, the 350Z (silver car), to the same scale. In Japan Z-cars are sold under the Fairlady name, and the design goes right back 40 years, when Nissans were marketed in many countries as Datsuns. The first of the line was the 240Z of 1969, which was a terrific all-rounder. I had a late model myself for a while, and it drove well, though there was little room for all my clutter. 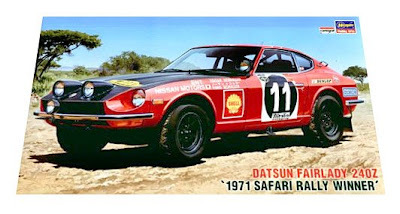 The Z was also a successful rally car - a 240Z won the mega-tough East African Safari rally in 1971. The Hasegawa model of this rally winner sometimes comes up on the collector market. The one shown above is available to buy here at an asking price of 23.90 Euros (£21.09 GBP, $32.25 USD).